Actually, the song isn’t bad to bad listen to, but bad in that you have to head over to SPIN.COM to listen to it. 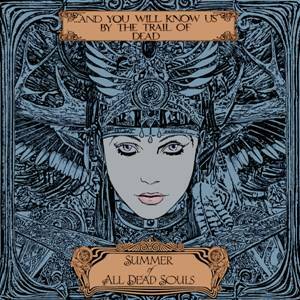 “Summer of All Dead Souls” is the least progressive, but no less showy, song I’ve heard Trail of Dead come up with and it’s the first single from their upcoming album, Tao of the Dead, which will be out February 8th, 2011. Yep, we’re already talking about next year. Formed in late 1994 by singers/guitarists/drummers Conrad Keely and Jason Reece, Trail of Dead has evolved over the years expanding their line-up while still being creatively driven by the core founding members. Friends since childhood, Keely and Reece started playing music in the indie rock town of Olympia , WA and eventually relocated to Austin , TX where they started …And You Will Know Us by the Trail of Dead. Their first release was a self-titled album that came out on Trance Records in 1998 and was succeeded by Madonna in 1999 on Merge records. …Trail of Dead toured the US with Superchunk shortly after and in 2002 they released Source Tags and Codes on Interscope Records. Over the next four years the band released two additional albums on Interscope Records – World’s Apart and So Divided before parting ways in the fall of 2007. In the Spring of 2008, …Trail of Dead launched their Richter Scale Imprint and thanks to a partnership in the US with Justice Records and in Europe with Superball Music, their sixth studio album The Century of Self was released in February 2009. The past two years has seen …And You Will Know Us by the Trail of Dead flourish with the return to their indie roots and with the regaining of their independence. Their last album The Century of Self earned them raves in the press. SPIN gave the album a four star review, The New Yorker raved “…ferocious…a new brand of progressive rock infused with anarchic execution…” and Billboard proclaimed Trail of Dead “…has once again found its footing.” In the Spring of 2010 the band entered a worldwide deal with Superballmusic and their Richter Scale Records Imprint. With a new deal in place, Keely and Reece are ready to unleash their latest opus TAO OF THE DEAD on February 8th, 2011 in North America, February 7th in the UK and Europe and February 4th in Germany , Austria and Switzerland . The band will of course be touring in support of the new album, kicking things off in Europe at the end of March on a co-headlining tour with Rival Schools and then heading out in the US at the end of April – dates to be announced shortly. I reviewed Trail Of Dead's Century Of Self for No Ripcord in 2009. If you're interested, you can find that here.